I'm in a standard fighting stance, squared off with Troy in the pocket. As I throw the left hook, I drop my elevation as though I'm going to follow with a double-leg takedown. Troy drops his hands to defend the takedown. To load up for the left hook, I lean forward and turn my shoulders and hips in a counterclockwise direction. The instant Troy drops his hands to stuff my shot, I come over the top with an overhand right, landing to his chin. I throw a straight left jab at Paco's chin. Notice how I keep my chin tucked and my right hand up to protect my face. As I pull my jab hand back, I reset my base and drop into a crouched stance. Immediately I close the distance between us by exploding forward off my right foot and stepping my left foot between Paco's legs, right on his centerline. The jab-to-double-leg takedown doesn't flow nearly as well as the hook-to-double. The reason for this is because the dynamics of the hook allows you to immediately drop your elevation for the shot. The hook also doesn't knock your opponent backward, which means he remains within takedown range. However, the jab-to-double is a good technique to have in your arsenal because it increases your options. It's always good to change things up. When executing this technique, you can throw the jab with bad intentions in order to faze your opponent for the shot or you can simply throw it as a fake. If your intention is to land the jab, then you will have to wait until the jab makes contact before dropping your level for the shot. Trying to do both at the same will most likely make both techniques sloppy. However, it is entirely possible to throw a fake jab that has little power and drop your elevation to shoot in at the same time. This comes in especially handy after you've nailed your opponent repeatedly with jabs and he has become accustomed to reacting in such a way that opens him up for a takedown. I always prefer to shoot in off a left-handed strike because it sets up my hips, base, and balance in such a way that I can m flow directly into the takedown. Executing a takedown off a right-handed strike such as the cross is a little more dif-0 ficult because it disrupts your wrestling base, which is mandatory for a healthy shot. You can still shoot in off the cross, Q but you must reset your base before you do so. There are two ways to do this. The first is to throw the cross, pull your W hand back into your stance, reset your hips, and then drop into a crouched stance and take your shot. The second way, fe which I show here, is to throw the cross and then step forward with your right foot. This allows you to reset your hips 0 and assume the wrestling posture needed for the takedown. I've found that this way is more explosive and direct, but it can change the way you shoot in. If you take a long step forward, you will be in a southpaw stance. A lot of fight-^ ers who come from a wrestling background actually prefer this because they are accustomed to exploding forward off their right leg when it's in front, but I like exploding forward off my right leg when it's back. In order not to steer too far from the familiar, I will just take a small step with my right foot to cover some distance and realign my base. As long as I haven't moved into a southpaw stance, I can still shoot in as I always do. It is important to learn both methods w because you never know how your opponent will react to your assault. If you knock your opponent backward with the cross, you might need to take a long step and shoot in from a southpaw stance in order to get the takedown. The more techniques you have tucked away in your arsenal, the better chance you'll have at achieving your goal. Whipping my hips in a counterclockwise direction, I throw a straight right cross to Paco's chin. Rather than resetting my base off the cross, I take a small step forward with my right foot. This small step is essential because it not only allows me to continue with my forward momentum, but it also allows me to reset my base and penetrate with a balanced shot. The instant my right foot hits the ground, I blast off my right leg and step my left foot between Paco's legs. As I do this, I wrap both arms around the back of his knees. From here I will complete the double-leg takedown (p. 30). This is a combination I learned from watching Mike Tyson fights, and it's a thing of beauty. The jab gets you to the inside, which sets you up to throw the hook to your opponent's body. The moment you land the hook, your opponent will most likely fold sideways under the power of the blow, which in turn sets you up nicely for the uppercut. The uppercut rocks your opponent's head back, creating an opening to land a left hook to his face. And as you have already learned, the left hook allows you to transition right into the double-leg takedown. There are countless different four-punch combinations that you can string together, but this is one of my favorites. I fire a straight left jab at Troy's chin. As my fist nears its target, I rotate my fist so that my palm is facing down. Ideally, you want to land flush with your first two knuckles. As I draw my left hand back, I rotate my shoulders and hips in a counterclockwise direction. This allows me to throw a powerful right hook to Troy's body. It is important to notice that I have employed my hips in the punch by pivoting on the ball of my right foot. Troy reacts to the body shot by dropping his elbow and coiling his body to his left, giving me an opening to land a right uppercut. Exploding off my right leg, I step forward with my left foot and wrap my arms around the back of Troy's knees. From here I will finish with a standard double-leg takedown (p. 30). Having rotated my body in a counterclockwise direction to land the body shot, my arm and body are in perfect position to deliver an uppercut. I come straight up the middle, crashing my fist into Troy's chin. The uppercut rocks Troy's head up and back, leaving his body vulnerable to a takedown. I make use of the opening by dropping my level, rotating my hips in a clockwise direction, and throwing a left hook to his body. This resets my hips and allows me to immediately shoot in for the double-leg. ¡3 When you shoot in for a takedown and your opponent stuffs your shot, you have a couple of different options. You can use all of your energy at one time and try to push through and complete the takedown. If you are a really good wrestler iil who is deathly afraid of your opponent's stand-up skills, perhaps you can manage it. Where there is a will there is a ¡A way. 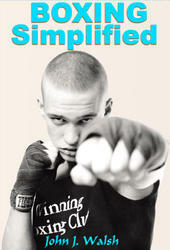 But in order to be a true mixed martial arts fighter you must be confident in all areas. You have to be able to mix D things up. When you shoot in and your opponent blocks your shot, a good option is to pull out and then unload with punches. Because your opponent just assumed a defensive posture to counter your takedown, there is a good chance q that you will catch him with his hands down. The moment he lifts his hands to defend your punches, you have another LU opportunity to shoot in and take him down. Even if you're a grappler who is fighting the best striker in the world, you - can't be afraid to climb into the trenches and strike. The better you get at blending punches with your takedowns, the ¡L more dangerous you become. I'm in a standard fighting stance, squared off with Reagan in the pocket. I throw a left jab at Reagan's chin. As I pull my right arm back into my stance, I rotate my hips in a clockwise direction. 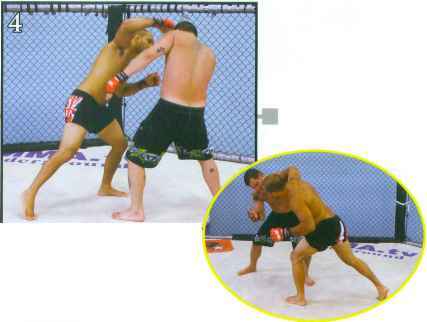 This allows me to throw the left hook, drop my elevation, and shoot in for a double-leg takedown all at the same time. As I bring my left arm back into my stance, I rotate my hips in a counterclockwise direction and throw a straight right cross. Reagan manages to get his arms underneath me. He steps back and stuffs my shot. Rather than give up and disengage, I continue forward, rotating my hips and shoulders in a counterclockwise direction to load up for a powerful left hook. Not expecting the immediate counter, Reagan gets plastered in the face. If your opponent stuffs your shot with a perfect sprawl and you know he's got you beat, working back to your feet is probably your best option. However, if your opponent sprawls and you feel that you might still be able to get the takedown, the cage can sometimes be your best weapon. Instead of working back to your feet, continue to drive forward until your opponent hits the cage. Once he is backed up against the chain link, he can no longer sprawl. This will sometimes allow you to get under his hips, pick him up, and slam him to the canvas. Leaning forward, I throw a left hook to Albert's face. As my left hook swings toward its target, I drop my level and shoot in for a double-leg takedown. I'm squared off with Albert in the pocket, ready to unleash my attack. I turn my shoulders and hips in a counterclockwise direction to load up for the left hook. Albert manages to block my shot by dropping his hips low and sprawling his legs back. 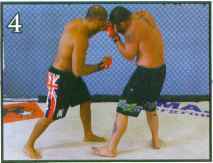 With Albert nearing the cage, I bring my left foot forward and post it on the mat. Rather than give up on the shot and work back to my feet, I drop to my knees and continue to drive forward. Pushing off my posted left leg, I drive Albert into the cage. No longer able to sprawl, his hips are forced upward. This takes his weight off my back and allows me to climb to my feet. Pinning Albert up against the fence, I wrap both arms around the back of his knees. Because of my positioning, I decide to pick Albert up, turn him away from the fence, and slam him. To learn your other options from here, visit the 'fighting against the cage' section. Lifting Albert off the mat, I pivot in a clockwise direction so I have room to slam him to the mat. Rotating my shoulders in a clockwise direction, I pull Albert's legs to my right, drive all my weight downward, and slam him to the mat. It is very important that you slam your opponent down using the shoulder you picked him up with. Because I picked him up on my left shoulder, I use my left shoulder to force him down. As Albert drops his hips and sprawls his legs back, he works to capture me in a front headlock. Wasting no time, I come up onto my feet and swing my right arm all the way around Albert's back. Having wrapped up my head, Albert is in a position to work for either a wrestler's front headlock or a guillotine choke. If he secures either hold, I will be in serious trouble, so I must immediately make my escape. You never want your head trapped underneath your opponent's armpit because it allows him to work for either a wrestler's front headlock or a guillotine choke. The most common way to end up in this position is when you shoot in with bad posture and expose your neck. You can also find yourself in this tight spot when your opponent pulls your head down from the clinch. Regardless of how it happens, it's not a position you want to hang out in. When I find myself with my head trapped underneath my opponent's armpit, I'll utilize the DeSouza Special, which I learned from Tony DeSouza, a world-class wrestler/jiu-jitsu player and friend. It's an excellent move because not only does it free your head, but it also gives you your opponent's back. I press my head into Albert and drive forward off my legs. This topples his base and he crumbles to the mat. As Albert collapses to his side, I secure his back by wrapping both arms around his body. Hooking my right arm around Albert's right side, I maneuver my body in a counterclockwise direction so that I'm perpendicular to his body. If you shoot in with bad posture, it is quite possible that your opponent will sprawl, wrap an ami around your head, pull you up to the standing position, and attempt to finish you with a guillotine choke. You can also end up in this lil compromising position when your opponent pulls your head down while in the clinch. If you find yourself caught in jj] a front headlock, you don't want to panic and pull away because it will usually allow your opponent to better synch D in the choke. Instead, you want to utilize one of two options. If your opponent doesn't have the choke sunk tight, you can trip him or drive him back into the fence, which allows you to work for a double-leg takedown. If your opponent does have a tight lock on your neck, it's best to defend against the choke. In order to do this, you use one hand to create UJ separation between your opponent's arm and your throat. At the same time, you throw your opposite ami up over his =! shoulder, as well as block him from driving his hips forward by digging your knee into his hips. These last two actions [J create separation between you and your opponent and hinder his ability to arch his back, which he must do in order to lock the choke tight. Once you achieve this defensive posture, it would be very foolish of your opponent to spend several minutes trying to lock in the submission. Not only would it waste precious energy, but it would also send a rush of blood to his arms, hurting his strikes and grappling later in the fight. Most opponents will simply let go and try something else. The only thing you really need to look out for when caught in the guillotine in the standing position is your opponent pulling you down into his guard. To learn how to escape when your opponent does this, visit the top guard section. Having wrapped up my head, Butch is attempting to finish me with a guillotine choke. Grabbing Butch's left wrist with my right hand, I pull his arm down to relieve pressure from my neck. To relieve more pressure from the choke, I throw my left arm over Butch's right shoulder. Backing all the way out, I assume my standard fighting stance. I lift my left leg and hook it around the inside of Butch's right leg. This blocks his hips and prevents him from being able to apply any real pressure with the choke. Breaking Butch's grip with my right hand, I pry his arm away from my neck. Then I place my left foot on the mat and begin to back out and disengage. As I back away, I keep my left hand up and continue to hold onto Butch's left hand. This prevents him from being able to punch me as I create separation between us. When you get stuck underneath your opponent in the sprawl position, your primary goal should be to get back to your feet. A secondary option is to sit down and trap your opponent between your legs in the guard position. This will lil put you on your back, which as you will learn in an upcoming section can be a very compromising position, so there ijj should be some serious benefits if you choose this option. Perhaps you are taking serious abuse while trapped under-D neath your opponent. Perhaps your opponent is excellent at defending against takedowns but has no ground game whatsoever, and you feel confident that you can finish him from your back or sweep him over and claim the top position. It all depends upon the situation, but pulling guard simply because you want the fight on the ground is not good W reasoning. If you really want the fight on the ground, a better approach would be to return to your feet and then utilize — one of the techniques laid out in this book to bring the fight down and obtain the top position. Shooting into guard ¡f should generally be a last-ditch effort when all else fails. Paco manages to block my shot by catching me with his left arm and sprawling his left leg back. Although the double-leg takedown is out of reach, I still want to bring the fight to the ground, so I decide to shoot into guard. Posting on my left foot and right hand, I begin to slide my right leg in front of my body. With my right leg now in front of me, I fall down onto my right hip and hook my left foot over Paco's right leg. To capture Paco in my closed guard, I wrap my legs around his body and lock my feet together. To prevent him from posturing up, I wrap my arms around his head. Pushing off my right foot, I drive into Paco, place my head in the center of his chest, wrap my arms around his right leg, and grip my hands together. I drop my level and step my left foot to the outside of Paco's lead leg. 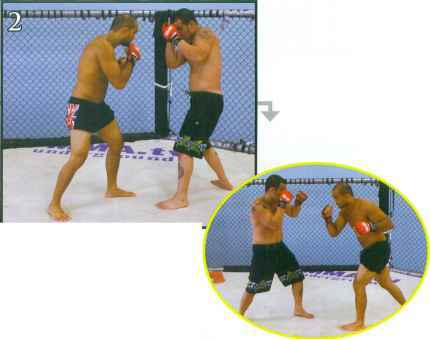 If you're in a standard stance fighting an opponent in a southpaw stance (right leg forward), it is very difficult to shoot in deep enough to execute a double-leg takedown because his hips are reversed. If you come from a wrestling background and are used to shooting in from a southpaw stance, the dilemma is easily remedied by throwing a strike, stepping forward into a southpaw stance, and then shooting for the double, but not everyone is accustomed to this. Instead of switching my stance, I tend to go for a single-leg takedown when fighting a southpaw. The only time 1 will go for a double in such a situation is when my opponent throws a left cross and I slip it. This changes the game because his hips are now centered and he will most likely be off balance, making that deep shot easier to manage. But the majority of the time you should be thinking about the single (if you're a southpaw fighter, then you'll want to focus on the single when fighting an opponent in an orthodox stance). The single is set up the same as the double; the only thing that changes is your entry into the takedown. Instead of stepping in-between your opponent's legs, you will step to the outside of his lead leg. You will also place your head to the inside of your opponent's body rather than the outside. I finish the takedown by climbing up to my knees and securing the top position. Bending my legs slightly, I sit my base back, pinch my elbows together, and pull Paco's right leg up to my chest. Keeping my left foot planted behind Paco's right leg, I drive my head into him. Notice how I am pinching his leg between my arms, chest, and left leg to keep it tightly secured. Continuing to drive my head into Paco, I rotate in a counterclockwise direction and trip him backwards over my left leg. Shooting in for a single-leg takedown off the left hook works just as well as shooting in for the double-leg takedown off the left hook. Your form will be the same in that you want to drop your level and begin your shot as you send the hook toward the side of your opponent's face. The only difference with this technique is that as you shoot forward you want to move your head toward the inside of your opponent's body and your lead leg toward the outside of his lead leg. I'm in a standard fighting stance, squared I throw a right cross at Paco's face. As I bring my right hand back, I rotate my off with Paco in the pocket. shoulders and hips in a clockwise direction to load up for the hook. Still whipping my hips and shoulders in a clockwise direction, I throw the hook. As my fist whips around, I allow my momentum to carry me slightly forward so I can drop in for the single-leg takedown. Stepping forward with my right leg, I reach around the outside of Paco's right leg with my left arm and around the inside of his right leg with my right arm. To secure his leg, I clasp both hands together. Stepping my left foot to the outside of Paco's right leg, I draw his leg up to my chest with my arms. From here I will continue with the standard single-leg takedown (p. 45). The overhand right is another great punch that sets you up for a single-leg takedown against a southpaw. Throwing the overhand drops your elevation, but instead of coming back up and resetting your base, you want to use the momentum generated by the overhand to continue forward into the takedown. However, in order to be successful with the single-leg, you must get your head to the inside of your opponent's body. I turn my hips in a counterclockwise direction, come up onto the ball of my right foot, pull my left shoulder down, and cast my right hand out in an upward arc. Notice how my back leg is straight and my front leg is bent into the punch. Instead of bringing my right hand all the way back into my stance, I reset my hips by taking a small step forward with my right foot. As I do this, I maneuver my head to the inside of Paco's body and wrap my left hand around the back of his right leg. As my right foot comes down, I wrap both hands around Paco's right leg and pull it up to my chest. I step my left foot behind Paco's right leg. From here I will complete the single-leg takedown and secure the top position (p. 45). Keeping Albert off balance, I land a right punch to his chin. Having shot in and secured Albert's right leg, I am working for the single-leg takedown. Instead of fighting for the single-leg takedown, I remove my right hand from behind Albert's leg and prepare to throw an overhand. I see countless fighters get stuck in either striking mode or takedown mode. This not only limits their options, but it also makes them predictable. You must always keep your opponent guessing. When you scoop up your opponent's lead leg, it can sometimes be difficult to secure the takedown, especially if your opponent has good single-leg defense. Continuing to work for the takedown will sometimes pay off, and other limes it will accomplish little more than burning a lot of energy. If you feel like you're wasting your time, a good option is to let go of the single-leg and throw an overhand right. A lot of the time your opponent will be so focused on hopping on one leg and defending the single-leg, he won't see the overhand coming. If you land the strike but don't knock your opponent out, you can swoop right back in and continue to work for the takedown. Once you land this move in a fight, the next time you secure your opponent's lead leg, you can guarantee he will be watching out for the overhand, which will take a portion of his focus away from defending the takedown.